Description: 350 enters Greensboro with an All-EMD Lashup, including an SD9M! 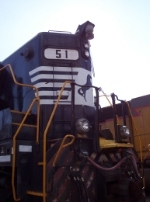 Description: NS SD9M #51 on 350. notice the electronic bell and frame stripe, new additions. Title: NS 51 & NS 2211 switch a cut of cars at Boylan Jct. Title: An unusual find on any class 1 RR: A trio of SD9's! Description: The 50 is leaving on 392 to Chatt. today and 51 next day, all NS's SD9m are being sent to Conway,PA for Retairement or Deadline.